Happy Friday to everyone and YEEHAW to everyone celebrating the Calgary Stampede today! It’s a small miracle that even with the city flooding just two weeks ago that the Stampede is still happening. Their motto this year is “Come hell or high water” which is very fitting considering everything we’ve been through. If you haven’t experienced the Stampede before you are missing out. The entire city parties for 10 days straight in celebration of cowboy hats, boots and plaid shirts. It’s a time when everyone in the city is your new best friend. I’m hoping to make it down several times in the next week so if you’re in Calgary and want to party let me know! 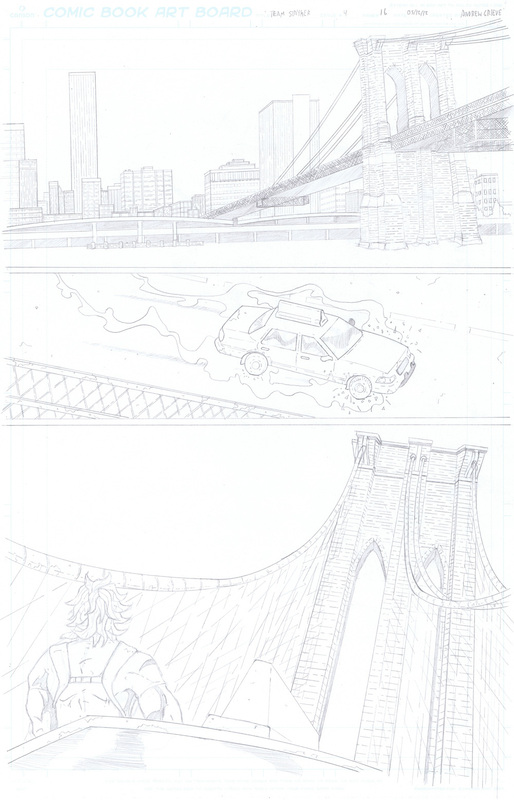 As for today’s update you could imagine that drawing an environment as complex as the Brooklyn Bridge can be very intimidating. There are just so many things that can go wrong when doing something like this that it makes it very hard to go in with a lot of confidence. I had to do a lot of research and there was a lot of trial and error. I was looking at old episodes of the Spider-Man cartoon from 1994 since they had several issues that involved the bridge. I wanted to try and capture the sense of scale without being too influenced by their style. Spider-Man has had several encounters at the tops of bridges so that seemed like a good place to draw inspiration from. Hopefully you all agree that it turned out alright.